A World War One view looking north-east towards the south or entrance front of Donington Hall. 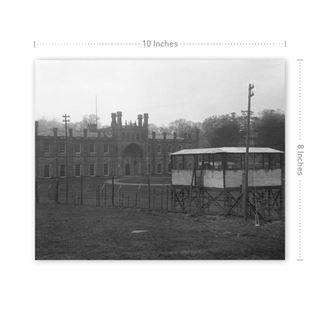 The security fencing (or 'entanglements' as the photographer termed them), the look-out post and the huts beside the house are all part of the prisoner of war camp that was established here to accommodate captured German officers. 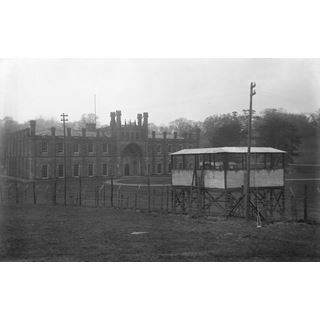 This camp achieved a degree of notoreity in view of its relaxed security and the relatively comfortable conditions afforded the officers, one of whom stated that 'the Commandant did everything he could to alleviate our hard lot'. There appeared to be no restrictions on the consumption of alcohol, the prisoners frequented the luxurious rooms of the Hall, were waited on by lesser ranks, and games of football, cricket, tennis and skittles were organised, all of which led to criticism in the press and a debate in the House of Commons. Matters were made worse by the escape of the dashing pilot and adventurer Gunther Pluschow (1886-1931). In July 1915, after watching one of the deer in the surrounding park push its way through the perimeter fence, he and an accomplice (who was later recaptured) did the same and was able to make his way back to Germany via London and the neutral Netherlands. As such he became the only POW to escape from a UK prison camp back to Germany in either world war. The Hall was built between 1790 and 1793 to the design of plasterer and architect William Wilkins the Elder (1751-1815) for Francis Rawdon Hastings, 2nd Earl of Moira and subsequently (from 1816) the 1st Marquess of Hastings. 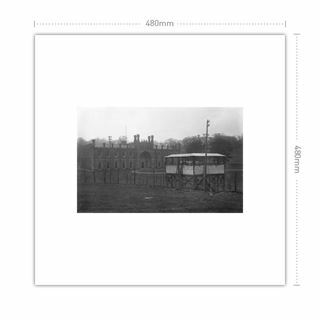 It is constructed to a courtyard plan in the 'fanciful Gothick manner' favoured by Wilkins. It remained with the Hastings family until 1902 when it passed to the Gillies Shields family who retained ownership until 1976. 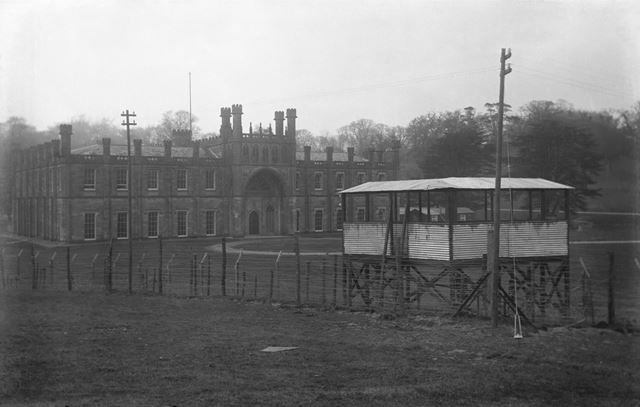 After closure of the prison camp in 1919, the Hall was run as a hotel before being occupied by the Army again (this time as a vehicle depot) during World War Two. Both the house and surrounding deer park were left in a poor state following this but the Hall was Listed Grade II-star in 1962. In 1981-2 it was refurbished to become the headquarters of British Midland Airways (who operated from the nearby East Midlands Airport) and remained in this use until 2012. The following year it was purchased by Norton Motorcycles. 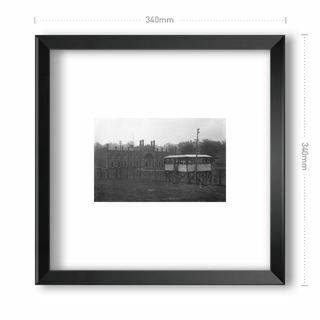 This view was taken by Derby-based postcard publisher F W Scarratt and was numbered 1021 in his series.